Why does the Healthcare environment need to improve? There are many bumps in the road that can delay or prevent us from making the improvements we desperately want to achieve; new services are required, accreditation standards are changing, customer needs are developing, process quality goals are still elusive, competition is rising and suddenly support is needed to maintain your continuous improvement culture. The Vative Healthcare team is committed to delivering positive organisational results through proven systems and tools to reach better patient outcomes, greater quality of care, reduce costs and boost employee morale. There are many Continuous Improvement methodologies out there, but none as tried and tested as Lean Healthcare – learned from industry but carefully contextualised to the Health environment. 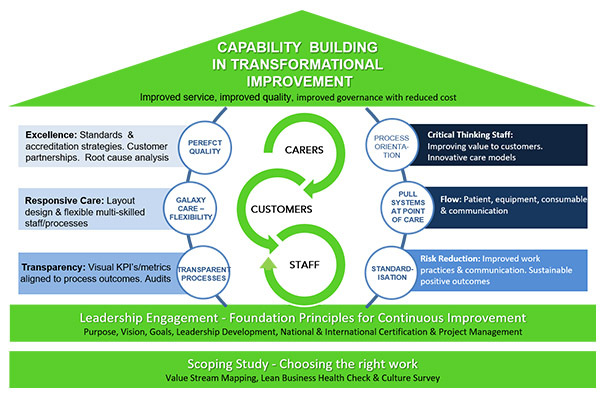 Our Lean Healthcare Business framework outlines an approach for the organisation wishing to make positive changes through transformational improvement. We work with staff at all levels of the organisation to achieve sustainable positive change. How Vative Healthcare deliver service and operational excellence with you? In Occupational therapy, introduction of new visual tracking system for all OT Equipment leading to a reduced loss of equipment and increase time spent with patients. In Residential aged care, streamlined care through reductions in wasted time (57%) and interruptions (64%) of Nurse manager day to day management.